Some nights, I absolutely love simply reflecting on the craziness of life. Where we came from, and the journey we took to get to where we are now. Also, one of the purposes of this blog was to connect memories to food (read the "about me" page if you haven't already to learn more!). So I'm going to work on doing that more often as well! Anyways, back to Thursday. Do you ever get one of those feelings where all you wanna do is sit down and think about the past? I had that feeling - and it's a good feeling! I went to a house that I consider my second home, where four of my closest friends live. I would say from last fall up until a few months ago, I would be at their house nearly every day. There is a group of 7-8 friends who became extremely close over the past year and this house became the go-to whenever we wanted a place to hang out. Thursday was my first time back in that house (with about half of the group there) in a long time, and it's funny how it still feels so much like a second home to me. I'm comfortable there and I always feel happy and at peace when I leave. I would go pretty much anywhere as long as that group of 8 people would go with me. When I left, I started thinking about all the changes we've been through since we've become close friends. Nearly half of the people in the group, originally all single, now have significant others. I'm planning on becoming roommates with 1-2 of them sometime in the winter. Huge job transitions. Heartbreak. Difficult conversations. Some have stepped up into leadership roles, and others have left leadership roles. It's always crazy to me to look back at who I was and who I am now. I am completely changed from the woman I was last year (a good thing), and I'm radically different from the woman I was two years ago (a really good thing!). Sometimes thinking back makes me sad and frustrated, but then I remember everything I overcame and how much stronger I am and I immediately feel better. Comforted. Happy. Peanut Butter & Co. recently partnered with Turkey Hill to make a limited edition ice cream - banana with peanut butter. 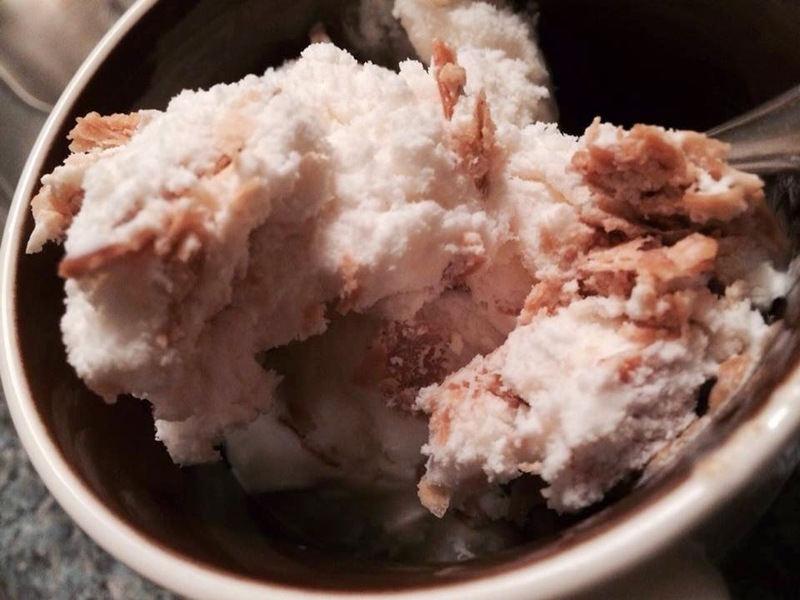 Delicious banana ice cream swirled with large strips of peanut butter. And, as a member of PB&Co. 's Yum Squad, I was sent a coupon for a free container of ice cream. Talk about YUM. I mean, do you SEE all the peanut butter in there?! The peanut butter is crunchy, just like chocolate chips. SO GOOD. Amazing. I'll tell you an example of just how good this ice cream is. My mom came home one day after I got the ice cream, and she was asking me all about it. Then she wanted to have her own, so went out and bought TWO half gallons of the stuff. I think I ate a mug of this cream nearly every day until it was all gone. I HIGHLY recommend running to your local grocery store & getting some! And, before I forget - it's only available through September, and you can only buy it in stores EAST of Mississippi. But it's amazing. So stock up! Sometime in the next week or two I will post again, with more fun surprises from Peanut Butter & Co. (I'll give you a hint...it involves gourmet pb&j!). Talk to you soon!